Located in northwest Italy, the Aosta Valley lies to the east of France, with Switzerland to the north and Italy’s gastronomic gem of Piedmont to the south. This may be Italy’s smallest region but with the highest peaks in the Alps, this tiny alpine region certainly packs a punch. Ancient Roman ruins, military fortresses, watchtowers and around 130 medieval castles will satisfy most culture-seekers while wine routes, superb cold meats and rich, creamy cheeses lead the gastronomic scene. During the winter, skiing, snowboarding and ice-skating are the main attraction but in summer, a holiday here is all about hiking against a backdrop of dramatic mountain views, pine forests, glaciers and small glassy lakes. The peaks of Monte Rosa, Cervino, Mont Blanc and Gran Paradiso dominate the Aosta’s landscape and provide some spectacular views and hiking opportunities. 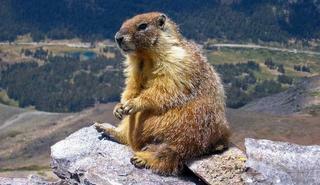 The Gran Paradiso is Italy’s oldest national park, inhabited by eagles, marmots and ibex, and with river valleys dotted with shepherds’ huts and pocket-sized hamlets. For the best views, take a ride on the Skyway Monte Bianco cable car. The 360° rotating cable cars connect Courmayeur with two further stations, including the Punta Helbronner summit station at 3500m where an open-air viewing deck provides breath-taking views of Europe’s tallest mountain. From the middle station, you can access Europe’s highest botanical garden, the Saussurea Mountain Garden at Pavillon du Mont Fréty Natural Oasis. This 1200-hectare protected zone features 900 plant species of wild flowers from Mont Blanc and other mountain ranges. 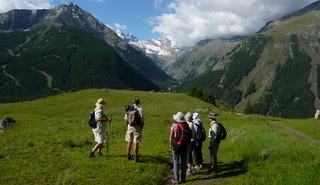 Other exceptional hikes in the region include those in the Val Vény, several of which are on the Tour Mont Blanc. Learn about the region’s rich feudal history from its castles and towers which, like Graines Castle in Brusson, date as far back as the 11th century. Amongst the most famous are the castles of Issogne, Sarriod de la Tour, Sarre, Saint-Pierre and Ussel. The 14th century Verrès castle, one of the most impressive in the region, is the backdrop for the annual Historic Carnival of Verrès. 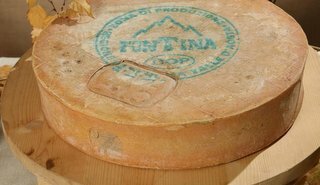 Regional cuisine ranges from traditional hearty local dishes such as carbonada (stewed meat) and superb creamy cheeses including Fontina, Gressoney and Reblec, to Michelin-starred restaurants. The region is also renowned for its black bread and for its walnuts, chestnuts and flavourful apples and pears. Excellent honey comes from the Valle di Cogne and a favourite dessert is the Montebianco – a rich concoction of chestnut puree, cream and chocolate. Enjoy the experience of tasting wines that are relatively unknown internationally, along wine trails through vineyards set on some of the highest elevations in Europe. Some of the top wines include Enfer d’Arvier, Torrette and the Nebbiolo-based Arnad Montjovet. 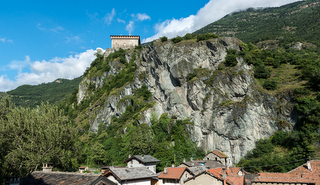 The regional capital is Aosta, where both Italian and French are officially recognised. 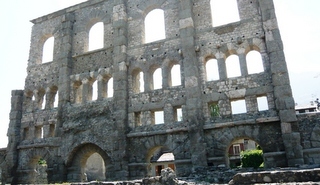 Much of the architecture dates to Medieval and Roman times and includes the Romanesque church of Sant’Orso, a Roman amphitheatre and Roman walls. You can learn more about the city’s Roman history at the Museo Archeologico Regionale. Highly recommended is the Cathedral of Santa Maria Assunta which has a neoclassical façade and a Gothic interior with stained glass windows and carved 15th century walnut wood choir stalls. 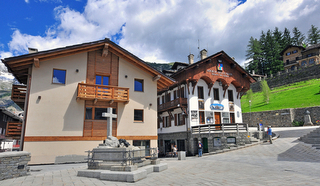 The pretty 17th century spa town of Courmayeur is the other principal town in the region. Sitting at the foot of Mont Blanc, the town is packed with bars, restaurants and upmarket shops. Other small towns include the more authentic, medieval town of Bard where highlights include 16th century buildings and the imposing Bard Fortress. Cogne is known for its lace-making and for its position as the gateway to the Gran Paradiso National Park. 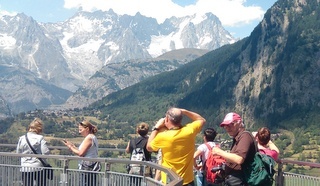 Our Best of the Italian Alps tour starts and ends in Turin and includes hikes in the shadow of the Gran Paradiso, Monte Rosa and Mont Blanc mountain ranges. 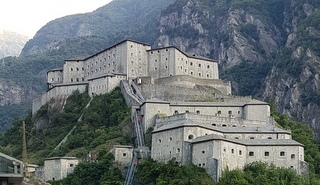 If you wish to take a tour in a neighbouring region, and extend your holiday with a stay in the Aosta Valley, we recommend our Jewels of Piedmont or our France and Italy tours. The Aosta Valley is closest to Turin airport although the region can also be easily accessed from international airports in Milan and Geneva. 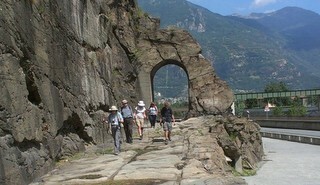 For more information about the Aosta Valley, visit the Aosta Valley tourist board.